The Educational Alliance in New York will feature the Jewish Art Salon’s 9-11 Window Installation at the Ernest Rubinstein Gallery, in concert with Tobi Kahn’s exhibit Embodied Light, 9-11 in 2011. Hours: Best viewed in daylight. Jewish Art Salon members have created “memory blocks”, with drawings, paintings or inscriptions that evoke their memory of the day. On September 13th, 6pm these blocks will be brought to the gallery, where Tobi Kahn is exhibiting “Embodied Light: 9-11 in 2011”. Artists and writers will share their block and/or their memories of 9-11 and Kahn will discuss his exhibit. After the session, at 8pm, the blocks will be gathered and the next day they will be installed as “towers” in the windows. 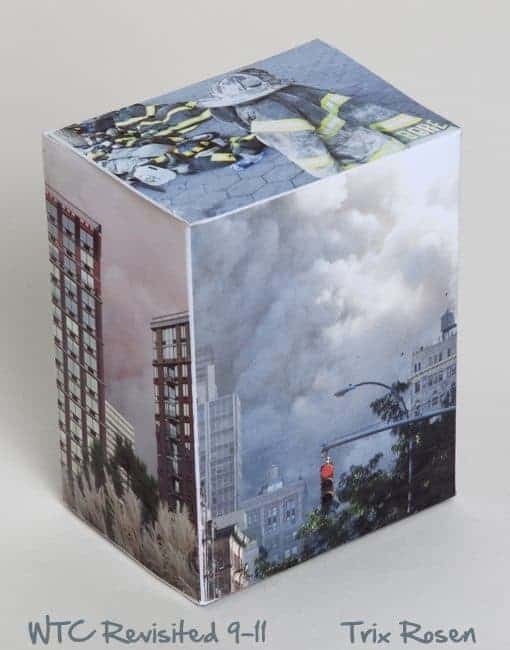 Kahn’s exhibit will feature 220 memory blocks, handed out by him to various New Yorkers and returned to him with markings that commemorate the day. These blocks will be continually rearranged over the length of the exhibition. The Jewish Art Salon’s blocks will be displayed as a separate exhibit. This is a strong reminder of that fateful day. Museum of Modern Art, (MoMA) New York NY.